This project aims to build capacity in national teachers by supporting them to develop teaching principles and reading materials in their local Mayoyao language. These materials will be used to help students from Kindergarten to Grade 3 develop foundational literacy skills in their local language before also acquiring the national languages of Filipino and English. 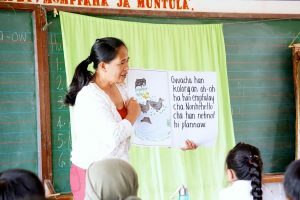 Sixty teachers will participate in a series of workshops over three years (2017-2019) to create reading materials and other literacy resources in the Mayoyao language. Project funds will be used to provide stationery materials and access to literacy trainers who can offer technical advice as teachers create reading texts. These materials will then be made freely available to other schools, with workshop teachers equipped to train colleagues in using and creating their own texts to enhance student literacy and learning. Click the link below to learn more or to support this project. The aim of the project is to build on the lessons learned through the successful implementation of the Bai minority language education program, by establishing an educational capacity building partnership in Yunnan province. The project aims to help with the building of strategically located university-based centres of expertise in the early educational needs of remote minority children, and for those centres to leverage their own experience to spread positive outcomes to children in many remote rural communities in China. 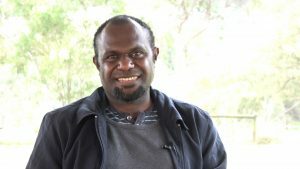 The initial goal is to sponsor a group of gifted and proven translators, two from PNG and one from Vanuatu, to study for the year at SILA Kangaroo Ground commencing in 2019. *We deliver Australian College of Theology (ACT) accredited units in the Diploma of Ministry (P2) (CRICOS Code: 054659K) through our partner Melbourne School of Theology (MST), an affiliated college of ACT (CRICOS Provider code: 02650E). complete national registration of the preschool curriculum and publish academic papers foundational to the curriculum. The ChiME-btg project was approved in July 2014 and will operate for three years. It will be supported by SILA consultants Dr Brian and Dr Liz Billard, co-founders of the Bai bilingual education program established in Yunnan Province in 2006 after several years of preliminary work. For ethnic minority children living in remote parts of China, starting school without being able to speak Chinese means that the issues of poverty and remote location are compounded by a huge language barrier. A pilot bilingual preschool education program addressing these issues has been started amongst the Bai people in Shilong village, Jianchuan County. 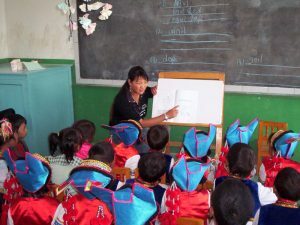 The program incorporates modern teaching techniques contextualised to the cultural and rural environment and it has been successful in providing Bai, Yi and Lisu children access to education in Chinese at the local primary school. These children, who would otherwise have struggled to attend or to perform in school, are now outperforming other children in the district. The Bai program has been running semi-independently since 2009. Local and provincial authorities are keen for the pilot program to continue to develop, with opportunities for replication in other dialect areas and minority language groups. In 2013 Yunnan authorities asked Brian Billard to assist in charting a way forward. The outcome of these discussions is a vision for a wider educational partnership addressing the needs of remote minority education in rural China, by building Yunnan level capacity for wider ‘mass’ replication and development of such programs in other minority areas. The vision presumes the achievement of sustainability through increasing national funding commitment, but there is a need through the development stages for international engagement and funding support. 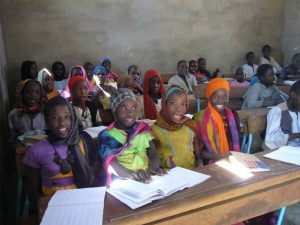 The Massalit Literacy Support (MLS) project will help facilitate the development and distribution of appropriate Massalit literacy teaching and learning materials for 4th and 5th grades in the schools in refugee communities in Eastern Chad. The project will also fund the development and distribution of class and community library kits. In the process, teachers will be trained to use the materials and some of them will be selected and mentored as trainers and supervisors to run training programs independently in the future. The goal is that Massalit children and their families will learn to read and write in their mother-tongue, a process which helps facilitates literacy acquisition in the national language and also affirms their intrinsic worth as unique and precious. The Massalit support project began in July 2013 and will continue for three years, supported by SIL workers in Chad. Having fled their homes in the West Darfur region of Sudan, the Massalit refugees in eastern Chad are trying to build the semblance of a normal life as they wait to return home. Traditionally subsistence farmers with little access to education, they are now highly motivated to become as educated as possible, while also preserving their language and culture. Many children, boys and girls, attend primary school in the refugee camps, while youths and adults attend community literacy classes. There is a huge thirst for learning, and for the Massalit literacy classes in the primary schools and in the community that help meet the felt needs of the refugees. The goal of this project was to help develop capacity of Solomon Islands communities to improve their own people’s literacy skills. Workshops were conducted to train participants from more than 12 language communities to develop and use instructional materials for use in small learning circles. LASI staff and language community representatives were trained and encouraged to continue to produce local language literacy materials. The project ran from February 2008 – 2011 and involved staff from SIL Australia and the Solomon Islands Translation Advisory Group (SITAG). 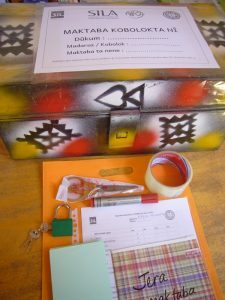 The focus of this project was to build increased capacity for literacy training and materials development in two Non-Governmental Development Organisations (NGDOs) – the Literacy Association of the Solomon Islands (LASI) and the Solomon Islands Bible Translation and Literacy Partnership (BTLP). The project built on an earlier project (run from 2008 to 2011) which provided assistance to more than 12 language communities in developing instructional literacy materials for adult literacy classes and groups. The work with LASI focused on developing a suggested framework for a total adult literacy program, developing relevant monitoring tools and further developing training programs and materials to support the implementation of such programs. The work with BTLP delivered further training to eight literacy projects commenced under the earlier project and expanded training and materials production to 2-4 new community language literacy programs. Funds from Australia through SIL Australia helped cover the costs to prepare and publish calendars and a variety of basic reading materials in the two local languages. These materials were integrated with non-formal education activities and income generating efforts that were operating within these communities as part of a wider development effort at the time. This project provided a central resource location for children’s education and literacy development by funding the building of a Community Centre for the Agarabi community of Papua New Guinea. The Centre is used as a place where people gather for development of their own language materials, including a dictionary and reading materials to encourage and facilitate literacy development. In addition, it provides a central location for teaching primary health care, a strong felt need, and for treating of non-critical health problems. This project sought to provide the means for children and teenagers in the remote Ama language area of PNG develop literacy skills in their own language, and then apply these skills also in Tok Pisin, a national language of PNG. Several SIL translation teams and local people developed thirty-seven teacher’s manuals (‘big-books’), 3 primers and a storybook. Local literacy teachers were trained to use the materials. Funds from SIL Australia paid for printing the three primers and the storybook, and their transport to the language area.